The 18th Annual Euro Meet Luxembourg: A Record-Setting Event! 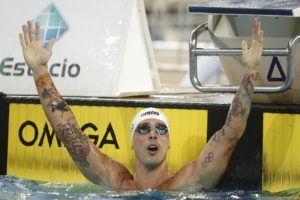 29-year-old Bruno Fratus fired off a world-leading 21.47 in the 50 free at Brazil’s Trophy meet. Tweet The 18th Annual Euro Meet Luxembourg: A Record-Setting Event! For many across the world, the Grand Duchy of Luxembourg conjures up images of ornate castles, vineyards, and powerful financial institutions. But for over 745 swimmers from 26 nations who travelled to this elegant country in January, the Coque Swimming Pool in Luxembourg City was their very first stop. Indeed, for many members of the global swimming community, Luxembourg is known as the home of the Euro Meet, which just celebrated its highly successful 18th year from the 29th -31st of January, 2016. An elite-level competition, the Euro Meet normally sees a number of swimming stars in attendance and spectators can enjoy watching quite a few records tumble. But this year’s Euro Meet sparkled with what can only be described as a pre-Olympic flame. A FINA-approved qualifying event for the 2016 Olympic Games, the three days of competition witnessed over 38 meet records smashed, a variety of national records broken, and several Olympic qualifying cuts achieved, in addition to numerous personal bests. Dazzling performances came from a variety of nations. World champion Marco Koch of Germany blazed through the 200 breaststroke in a speedy 2:07.69, bettering his time from Kazan and nearly setting a world record in the process. Hungarian Olympic champion Laszlo Cseh proved his preparation for Rio was in full swing, winning his events with four record-setting times. And Serbia’s Velimir Stjepanovic made a strong showing with meet records in the 100, 200 and 400m freestyle. On the women’s side, Spain’s Mireia Belmonte set two meet records in the 400 and 800m freestyle, helping the Spanish National Team place 1st overall in the team classifications. Hungary’s Katinka Hosszu dominated with seven meet records, while Luxembourg’s own Julie Meynen set a national record in the 50 freestyle, coming within 3/100ths of making the Olympic qualifying A-cut. These were just a few of the highlights at this year’s competition, where not a single session – prelims or finals – went by without at least one meet record set. The prize money offered at the Euro Meet – in the form of €300 per meet record, plus €300, €200, and €100 for 1st, 2nd, and 3rd places, respectively – served to sweeten the deal for the athletes. High point team awards were also presented, with the Spanish National Team taking first place, followed by Energy Standard and Hessischer Schwimmverband. 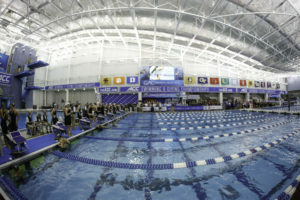 Adding to the dynamic atmosphere on the pool deck was the ardent support from the packed spectator stands each evening. Prime Minister Xavier Bettel was in attendance on Friday evening, cheering on swimmers and presenting medals, a clear indication of the respect that the country of Luxembourg has for its national swimming team and for the Euro Meet. André Hoffmann, President of the Luxembourgish Olympic and Sporting Committee arrived for the Saturday evening finals, as did representatives from the Euro Meet’s sponsors, including Cactus Supermarkets, SEO, Loterie Nationale, and Baloîse Assurances. Mr. Szabolcs Fazakas, Hungarian representative at the European Court of Auditors, who makes a yearly appearance at the Euro Meet, returned once more during the finals session to lend his support to the swimmers. And fans from near and far filled the stands to demonstrate their devotion to the swimmers. Whether they were there for the Luxembourg National Team members, the Hungarian participants or the numerous other countries in attendance, the supporters helped make the Euro Meet events even more exciting. Clearly, the participants at the Euro Meet have many positive comments to make about the competition. However, behind every successful meet is a dedicated, passionate organizing team, and what truly makes the Euro Meet shine are the people working behind the scenes to produce an event that not only runs like clockwork, but that also offers a warm and friendly welcome to all who attend. Luxembourg Swimming Federation President Marco Stacchiotti was the veritable face of the event, and could be seen at all moments of the competition on the pool deck, giving medals, welcoming teams with a beaming smile and friendly demeanor, and greeting VIP and sponsor representatives. Meet director Gil Kandel has worked year-round to coordinate all the various sections within the organizing committee, and was the point of contact for all participating clubs, coaches and swimmers. Kandel also plays an active role in seeking ways to improve the Euro Meet each year. And meet manager Christian Hansmann was truly the go-to person during the meet itself, ensuring that each aspect of the event ran smoothly. The Euro Meet also included an international contingent. Press Officer Georges Kiehl, who hails from France, managed the media aspects of the Euro Meet, while Finnish speaker Jussi Salminen brought the three days of the competition to life through the power of his voice during both morning and evening sessions. Jacky Ribeiro of Megatek France managed the impeccable electronic timing and scoreboard provided during the competition and several of the FINA-listed officials were also internationally-based. Behind the principal members of the organizing committee stood an army of staff and volunteers, each playing their own key role in making the Euro Meet a successful event, similar to individual players in an orchestra. The coordination between all of the groups during the competition was impressive, attesting to the professionalism of the organizing committee and their love for the Euro Meet. The 18th edition of the competition is now over, the pool has returned to its normal, tranquil state and the stands have emptied. But you can still relive the memories through our dramatic photo gallery of over 1000 images from the competition or view our exclusive interviews with swimmers, coaches and teams in attendance. We’re looking forward to seeing you next year! Julia Galan is a lifelong competitive swimmer and a USA Swimming and U.S. Masters Swimming coach. 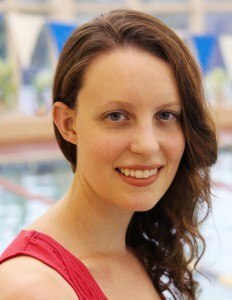 Julia’s passion for the sport, for coaching and for writing led to the creation of Swimspire, a coaching and swimming inspiration source geared towards athletes of all levels and goals. VISIT THE SWIMSPIRE HQ HERE. LIKE SWIMSPIRE ON FACEBOOK HERE. FOLLOW SWIMSPIRE ON TWITTER HERE.